This Inklingo PDF has hexagons with 3 inch sides (6 inches across from point to point) plus both halves, quarters, and thirds. Several other sizes are available. 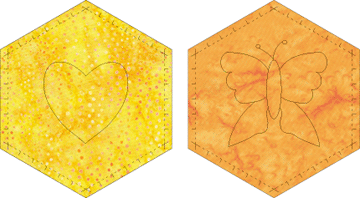 Appliqué The hexagons are provided with two bonus designs for embroidery or appliqué. 3.0 inch sides This is a big hexagon, 6 inches from point to point, but I had several requests for it, especially from quilters who are using Inklingo Shape Collection # 3 and Candied Hexagons from Australian Patchwork and Quilting.